Chagatai Khan: Ansar Abbasi, Shaheen Sehbai & Biased/Partial NAB. Ansar Abbasi, Shaheen Sehbai & Biased/Partial NAB. ISLAMABAD, August 3: Pakistan's National Accountability Bureau has often been accused of being more of a tool for political victimization than an instrument of accountability. The draconian provisions of the NAB Ordinance and the selective manner in which these have been applied has also come under criticism. But, politics apart, let us take a look at the NAB from the vantage point of Parliament. On December 5, 2003, a question was asked about the military officers working in civil departments against whom cases had been registered by the NAB during the previous two years. The 14 military officers on the list included a former lieutenant general heading a civil department, as being "under investigation for accumulating assets beyond his means." The endless investigations apparently still continue, while the lieutenant general roams free, unlike politicians under investigation. Another question on the same day was about the expenses on foreign trips made by NAB officials. Forty-eight foreign trips had been undertaken by NAB officers at public expense during the previous two years, costing over Rs10 million. One senior officer alone made 16 foreign trips that cost the exchequer some Rs3.3 million. Twenty-five of these visits were undertaken for participation in seminars, conferences and conventions in various world capitals. The officials made three trips to Riyadh and Dubai to attend Pakistan Day celebrations, to make presentations to the Pakistan Executive Group, and to address members of PPF, whatever that means. A senior officer of the Bureau, during several journeys to European countries, also traveled to Dubai ten times, the purposes of the trips not being explained in most cases. While visits at public expense to world capitals for "attending conferences and seminars" may be understandable, what purpose did the ten trips to Dubai serve? On Dec. 9, 2004, Senator Sanaullah Baloch asked how much money had been recovered under plea bargains from politicians and civil and military officers on the orders of the court. It was revealed that whereas an amount of Rs432 million had been recovered from politicians, nearly two billion rupees had been recovered from the civil-military bureaucracy under pleas bargain. Who said the politicians were the most corrupt segment of society? On Dec. 2, 2004, a questions was asked about the status of NAB cases against sitting members of Parliament, if any. Nine sitting MPs were named against whom there were cases of corruption, misuse of authority and accumulation of assets beyond their known sources of income. Some of the cases were under trial, some under investigation, some"under process," whatever that means, and some closed for undisclosed reasons. Federal ministers Faisal Saleh Hayat, Aftab Sherpao, Rana Nazir Ahmad, Jehangir Khan Tareen and Liaquat Ali Jatoi were named in the list. 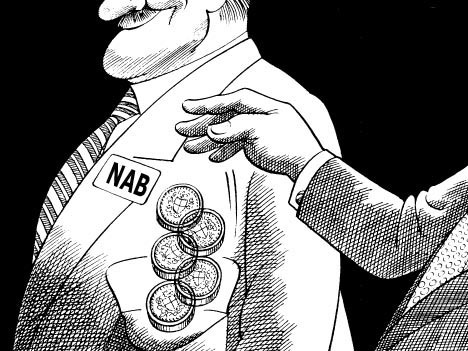 All had been the target of the NAB until they joined the King's Party, were rewarded with ministerial jobs and let off the hook. The chairman of the Senate Committee on Foreign Affairs, Syed Mushahid Hussain, had also been named as being involved in a case of "misuse of authority." The case was closed in May 2002 after over two years of investigation, the government said in its reply. Just when the opposition asked why cases were closed on the eve of the general elections, Mushahid Hussain rose in the House and challenged the NAB. He stunned everyone by saying that he had not even been informed of any case against him let, alone his being under investigation, and the case closed after such investigations. A privilege motion was filed against the NAB for misleading the House. The meeting was scheduled for Dec. 22 and the chairman of the NAB summoned to attend it. At midnight on Dec. 21, panic telephone calls by the Senate Secretariat informed the members that the meeting had been cancelled, but no reason was given. When the meeting was rescheduled for Jan. 6 this year, the chairman of the NAB was exempted and not called to attend it. Does it require too much imagination to guess why the first meeting was cancelled and why the chairman was not asked to attend the rescheduled meeting? The opposition protested and asked that the meeting be adjourned to another date and the chairman directed to appear in person to answer some questions. As they staged a walkout the government lost no time in rushing through the procedure to reject the privilege motion. Who hides what, and from whom? During a reply to a question last Feb. 15, it transpired that the NAB had paid Rs390 million as fees to lawyers during the past five years. The expenditure incurred on the boarding and lodging of NAB officers to represent the Bureau in the courts was in addition to this amount. Various provisions of the NAB Ordinance have been likened by legal experts to the notorious POTA in Indian Kashmir that Pakistan has been condemning at all international forums. But while the POTA has been disbanded the NAB Ordinance continues to be applied with relish. This emerged in dramatic form when sometime ago the Supreme Court asked the NAB's chief prosecutor whether petitioner Siddiq ul Farooq, the information secretary of the Pakistan Muslim League (Nawaz), was in NAB custody and what the status of investigations against him was. In reply, the prosecutor general admitted that the petitioner was in NAB custody. 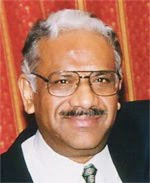 But he added that he could not inform the Court about the case, because after being arrested, Siddiq ul Farooq had been "dumped somewhere," and he did not where he was kept or what the status of investigations was. The draconian provision requiring an accused to prove innocence has also been applied against the political class with sadistic pleasure. In an interview with The News sometime ago a former chairman of the NAB gleefully remarked that it was not the Bureau's task to prove charges against the corrupt, "the accused must prove his innocence." The writer is a Senator and member of the Defence Committee of the Senate who is active against corruption by the Generals ruling Pakistan. Email: drkhshan@isb.comsats.net.pk Copyright © 2002-05 South Asia Tribune Publications, L.L.C. All rights reserved.